When Walmart announced on Monday that it would install 15 megawatts’ worth of solar arrays on as many as 30 of its stores in California and Arizona, it set out to shape the solar market in more ways than one. The reason? The world’s biggest retailer specified that many of the new solar installations should use thin-film photovoltaic panels. Thin-film solar cells are printed or deposited on glass or flexible materials. And although they are less efficient at converting sunlight into electricity, they can be produced at a lower cost than traditional crystalline silicon solar cells. Thin-film solar currently accounts for just about 20 percent of the solar market. The most technologically advanced versions have had a difficult time grabbing market share due to competition with low-cost Chinese crystalline silicon manufacturers and a recession that has dried up investor funding. Walmart signed a deal with SolarCity, a leading Silicon Valley solar installer, to manage the project. SolarCity will install and own the photovoltaic arrays on Walmart stores and sell the electricity to the retailer. SolarCity’s chief executive, Lyndon Rive, told me Monday that the company will install thin-film solar arrays made by First Solar and Miasolé. First Solar, which makes an older variant of the technology called cadmium telluride, is the world’s biggest thin-film manufacturer and Walton family members were early investors in the Tempe, Ariz., company. 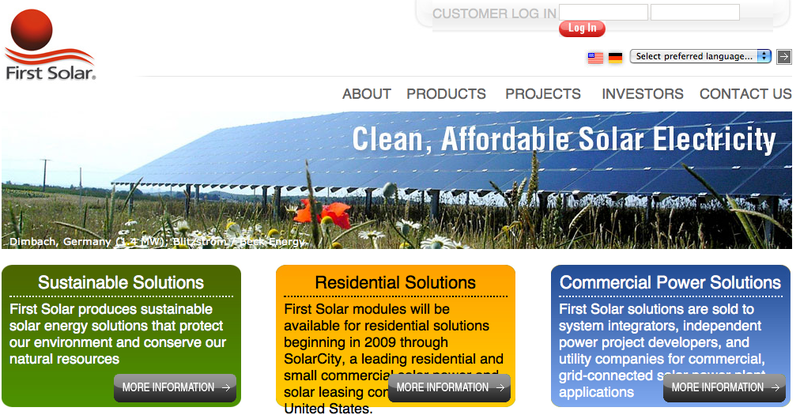 First Solar is also an investor in SolarCity, which already uses its photovoltaic panels. Miasolé, a Silicon Valley startup, is one of a number of companies that has developed a type of thin-film solar cell called copper indium gallium selenide, or CIGS, that offers the promise of higher efficiencies and lower costs. “Walmart wanted to see thin-film be adopted and made that a requirement in the bidding process,” says Rive. He noted that the retailer did not dictate the percentage of stores that should receive thin-film solar arrays but expects the technology will account for the majority of installations over the next year. “There’s no hard and fast number but they’d like us to do as much as possible,” said Rive. The bigger ambition, though, is to shape the solar market, as Walmart acknowledged. TXU Energy, a Texas utility with two million customers, is making it possible for homeowners in the Dallas area to lease or buy rooftop solar-power systems in one of the first programs of its kind. 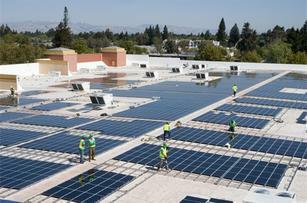 The energy provider said Wednesday that it had signed a deal with SolarCity, a Silicon Valley start-up that finances and installs residential rooftop arrays, to manage the initiative. Homeowners will sign up for the TXU Energy Solar Program through the utility, and SolarCity will design and install the solar-panel systems. Under the lease program, the owner of a three- to four-bedroom house would typically pay about $35 a month after tax incentives, according to TXU Energy. SolarCity retains ownership of the photovoltaic arrays and responsibility for their maintenance. The solar-power system could be bought outright for about $26,000, TXU Energy said. SolarCity will pay a referral fee to TXU Energy for each system leased or sold. You can’t get more California greenin’ than this. Peter Rive can charge up his Tesla Roadster electric sports car in his San Francisco garage with carbon-free electricity supplied by a solar array on his roof. Then, if he’s in the mood for a road trip, he can drive to Los Angeles, stopping at a solar-powered charging station along the way to top off the battery. So what’s a solar company doing installing highway charging stations for six-figure sports cars driven by people with seven-figure salaries? In part, it’s a result of SolarCity’s connection to Tesla and grants the electric carmaker received from the state of California to demo charging stations. It makes for great PR, of course, but the bigger picture here is how the emerging electric vehicle industry will drive (sorry) the adoption of residential and commercial photovoltaic systems. When Wall Street collapsed last year so did tax equity funds, the primary vehicle to finance renewable energy development. But as I write in The New York Times today, investors are beginning to jump back into the game. The credit crunch has walloped the residential solar industry, making it hard for installers like SolarCity to tap investor funds to finance rooftop arrays for their customers. But in a sign that the recessionary clouds are parting a bit, SolarCity on Tuesday said that U.S. Bancorp has agreed to finance $100 million worth of solar installations in 2009. That’s double the money the bank committed to provide SolarCity in June when the original deal – but not the financial details – was announced. SolarCity, based in the Silicon Valley suburb of Foster City, offers customers the option of leasing their rooftop panels and thus avoiding the five-figure cost of buying a solar system. The company retains ownership of the solar array and thus qualifies for a 30 percent federal tax credit against its cost. Since most startups have no use for such tax credits, they give them to investors in exchange for financing installations. Still, most such tax equity partnerships have collapsed along with the Wall Street banks that often funded them. In fact, U.S. Bancorp stepped in after Morgan Stanley pulled the plug on a financing arrangement with SolarCity earlier this year. The economy may be all trick and no treat, but you wouldn’t know it from First Solar, one of the few public solar cell makers and thus a bellwether for the industry. This week the Tempe, Ariz.-based company reported solid third-quarter earnings and unveiled two deals that mark a big expansion in the U.S. market. “By combining Mission’s extensive track record of power project development with First Solar’s low-cost systems and construction capability, we believe we’ve created a powerful engine for future growth in the U.S. utilities segment,” First Solar CEO Mike Ahearn said during the company’s earnings call Wednesday, according to a transcript published by the Seeking Alpha business blog. But it was Ahearn’s comments on the European market – 85% of First Solar’s business is in Germany, for instance – that is of most interest to investors. While he predicts the European market will remain strong – First Solar expects its 2009 net sales to range from $2 billion to $2.1 billion, up from $1.22 to $1.24 for 2008 – he did note some red flags, particularly for utility-scale solar power stations. “We believe most of our European customers outside of Germany have sufficient balance sheet strength to bridge any near-term projects delays,” he added. During the Solar Power International conference in San Diego this month, there was much buzz that solar companies that had ramped up their production capacity over the past couple of years would be hit by an oversupply of solar modules just as customers get crunched by the credit crisis. But Ahearn told analysts on Wednesday that First Solar’s thin-film modules – which are made by depositing solar cells on plates of glass and use minimal amounts of expensive silicon – would continue to sell for less than conventional cells and thus remain attractive to customers. “We therefore assume that any price competition is unlikely to have a sustained impact on First Solar,” he said. Despite First Solar’s moves into the U.S. market, Ahearn acknowledged the immediate future is uncertain. While Congress extended a key investment tax credit for eight years as part of the financial bailout package, investors have lost their appetite for tax equity partnerships that would buy those credits from solar companies in exchange for financing the construction of power plants. In a move that will bring thin-film solar panels to the U.S. residential market, First Solar has signed a deal to provide installer SolarCity with 100 megawatts’ worth of solar arrays over the next five years. First Solar is also investing $25 million into SolarCity, the Silicon Valley startup backed by Tesla Motors founder Elon Musk. This is First Solar’s initial foray into the home market — and apparently the first of any thin-film solar module maker. Thin-film solar panels are made by depositing solar cells on sheets of glass or flexible material and use little of the expensive silicon that forms the heart of more bulky conventional solar modules. That makes thin-film panels cheaper, although they are less efficient at converting sunlight into electricity. 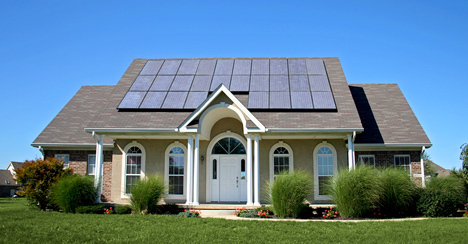 And thin is in for homeowners who prefer less-obtrusive panels on their roofs. Beginning in early 2009, SolarCity will start receiving 20 megawatts’ worth of First Solar panels a year. Rive won’t disclose how many megawatts SolarCity currently installs annually, but 20 megawatts would seem to represent a significant expansion of the startup’s operations. Over the past two years, SolarCity has installed solar arrays for 2,500 homes and small businesses and a spokeswoman says the First Solar deal would supply enough panels for about 5,000 homes a year. The deal also marks a move to diversify on the part of Tempe-Ariz.-based First Solar (FSLR) — known as the Google (GOOG) of solar for its once-stratospheric stock price. The company, backed by Wal-Mart’s (WMT) Walton family, had primarily focused on the overseas commercial rooftop market. This year though First Solar has signed deals to build thin-film solar power plants for utilities like Southern California Edison (EIX) and Sempra (SRE). First Solar on Wednesday reported that third quarter revenues rose 30% to $348.7 million from the second quarter and was up 119% from the year-ago quarter. Profit spiked 42% to $99.3 million from the second quarter and increased nearly 116% from a year ago.